SAT cables | View our catalogue products | SiliconBlue Corporation Ltd. SAT connection cable, F-Connector M/M, 1.5m, 90dB, gold, wh SAT connection cable, F-Connector M/M, 1.5m, 90dB, gold, wh. Quality cable for digital HD Satellite-TV reception. Gold plated plugs for improved signal transference. SAT connection cable, F-Connector M/M, 10.0m, 90dB, gold, wh SAT connection cable, F-Connector M/M, 10.0m, 90dB, gold, wh. SAT connection cable, F-Connector M/M, 2.5m, 90dB, gold, wh SAT connection cable, F-Connector M/M, 2.5m, 90dB, gold, wh. 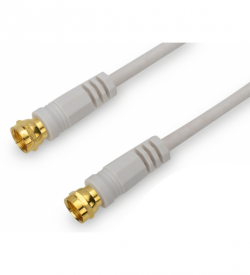 Quality cable for digital HD Satellite-TV reception. Gold plated plugs for improved signal transference. SAT connection cable, F-Connector M/M, 5.0m, 90dB, gold, wh SAT connection cable, F-Connector M/M, 5.0m, 90dB, gold, wh. Gold plated plugs for improved signal transference. Reduction of interfering signals by multiple screening.